It had been yet another long week of cold 20-degree weather and snow. Spring and warm sunny days seemed to be a cruel fantasy. The cold had me stalking the house, grumbling and moody, to the point where the dogs just stayed out of my way. Then my savior came in the form of an email: “Hey, are you available to go to Florida for four days to attend Porsche and Hertz’s press trip to Sebring?” You’re damn right I was! It was a system shock: leaving cold and snowy Cleveland, and two hours later deplaning in sunny Orlando. 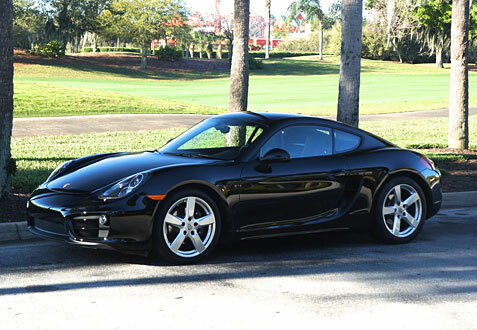 Hertz had provided a beautiful black 2014 Porsche Cayman coupe for my stay. It was my first time behind the wheel of the new Cayman. Like all Porsches, it was fast, drove like a slot car, and made me feel like a race car driver on holiday. I got several compliments on my car during my stay in Florida. I felt a bit guilty. After all, it wasn’t my car. Buy a shiny black Porsche if you want to be a mini-celebrity. This highlights the Hertz’s Dream Car collection, where any citizen with a credit card can rent for the weekend a series of highly desirable super cars. Depending on the location, Porsches, Ferraris and even Lamborghinis are available for hire for the right price. Hertz has a long history of loaning out the era’s fastest cars. In the ‘60s, the famous Shelby GT350H “Rent-a-Racer” could be had for a weekend on the track. The Dream Car is a modern interpretation of that idea. Of all the makes in the Dream Car collection, Porsche and Hertz seem to be the best-suited partnership. Porsches are driver’s cars that have a unique quality in supercars: they’re comfortable and practical, which make them great rental vehicles. Both Porsche and Hertz focus on the driver’s experience. Renting a Porsche for the weekend gives you a luxury car that’s designed to be driven, not coddled and babied like some of the Italian ilk.